In mid-November crews began to set-up work zones within the roadway at both the northwest and southwest corners of Don Mills Road and Eglinton Avenue East as crews continue to relocate existing utilities at the intersection. Work began on relocating hydro utilities and work continues on relocating telecommunication lines within man holes as well within pre-existing duct banks in preparation for station construction. Work began mid-November 2016 and will continue for approximately six (6) weeks. Most work will occur between 7:00 a.m. and 7:00 p.m. Some work will occur during extended hours to 11:00 p.m. Limited overnight works are also expected. Updates on works taking place during extended or overnight periods will be communicated separately. Work zones set-up within the roadway at the northwest and southwest corners of Don Mills Road and Eglinton Avenue East. For safety purposes, fencing and concrete traffic control barriers will be erected around the work zones. 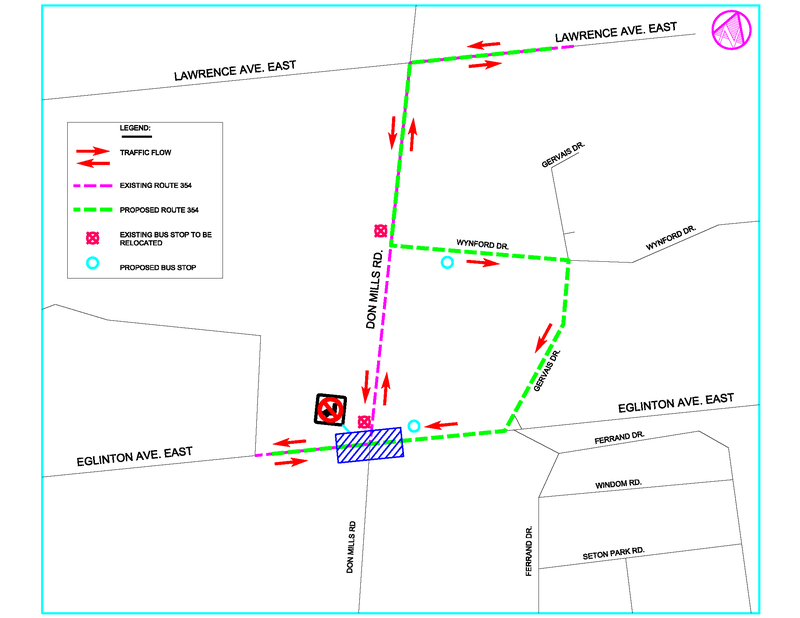 Lane reductions are required on Don Mills Road and Eglinton Avenue East to complete this work. A minimum of two lanes of traffic will be maintained in all directions with designated left-turn lanes. Right turns from southbound Don Mills Road to westbound Eglinton Avenue East will be prohibited for all vehicles, including TTC buses. Signage will be placed on Don Mills Road to advise motorists of restrictions. 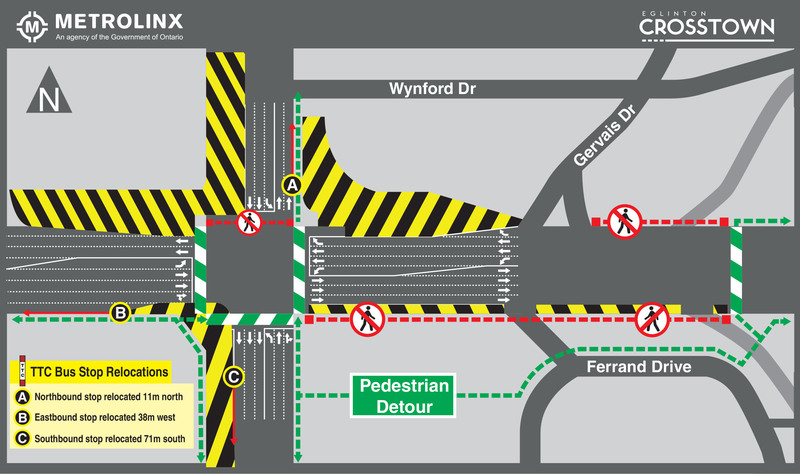 The west-to-east crosswalk on the north side of Eglinton Avenue East and Don Mills Road will be closed. Existing sidewalk detours and closures remain in effect during this stage of work. TTC Bus Route #354 (Lawrence East) overnight bus will detour at Wynford Drive where it will travel east to Gervais Drive, travel south on Gervais Drive to travel west on Eglinton Avenue East to resume the regular route (refer to map above).